The new SDK is designed to simplify the process of dealing with underlying network discovery and communication technologies that normally make this type of connection difficult to implement. The SDK offers a standardized way to communicate between your apps over a local network allowing developers to focus on building new and unique user experiences. Even developers who don’t have an existing Amazon Fire TV app can take advantage of the SDK’s media playback capabilities since a default built-in receiver plays these for you automatically. This is one of the quickest ways to leverage the power of our service and the built in functionality of the Amazon Fire TV and Fire TV stick. What Can You Do With the new SDK? Red Karaoke uses an iPhone to send audio to their Amazon Fire TV app. Karaoke Party by Red Karaoke, one of the first karaoke smartphone apps in the market, is leveraging the SDK to display song lyrics and videos on Amazon Fire TV. Additionally, Red Karaoke uses the SDK to send audio from the microphone on the customer’s device to the TV. Customers can now have a true Karaoke experience in their living room. With Fling, Rivet Radio customers get the capability to share music and videos on the largest screen in the house. 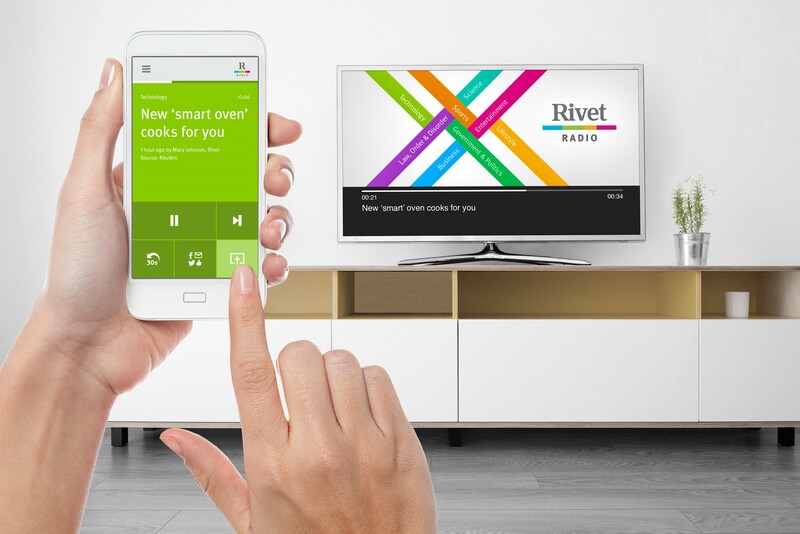 Rivet Radio, a digital news radio broadcaster, allows people to listen to news on the TV. 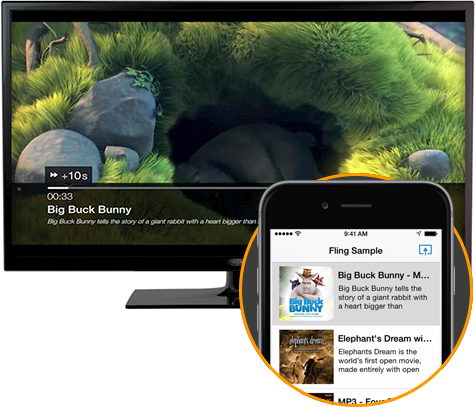 By leveraging Amazon Fire TV’s built in media playback receiver, Rivet Radio lets listeners easily transition between listening on their personal device to sharing content with everyone in the living room. There are more great apps that use our SDK coming and we are looking forward to seeing what developers come up with. The new SDK is available today with support for iOS, Android and Fire OS. To get started visit the SDK page and download the .zip file. You can also read the getting started documentation, which will walk you through setting up your development environment for Android or iOS, Integrating the SDK into your Android or iOS app and integrating the Amazon Fling SDK into your Amazon Fire TV app. If you don’t have an Amazon Fire TV app, you can use the Amazon Fire TV default media player (already installed). If you’ve created an Amazon Fire TV app already, you can integrate the receiver SDK that will enable people to discover, remotely install (if needed) and control your Amazon Fire TV app while flinging media content to your media player. Already Have An App that Supports Chromecast? Our new SDK makes it easy for developers to adapt their existing apps that have Chromecast functionality to fling to Amazon Fire TV. For more information on how to do this, check out our guides to integrating the SDK with an existing Android Chromecast app or iOS Chromecast app in the developer portal. Big Buck Bunny is copyright 2008, Blender Foundation / www.bigbuckbunny.org and is licensed under the Creative Commons Attribution License 3.0, available at https://creativecommons.org/licenses/by/3.0/us/legalcode. Elephants Dream is copyright 2006, Blender Foundation/ Netherlands Media Art Institute/ www.elephantsdream.org and is licensed under the Creative Commons Attribution License 2.5, available at https://creativecommons.org/licenses/by/2.5/legalcode.